Does your aging loved one need some assistance with their activities of daily living, such as bathing, dressing, toileting, or meal preparation? You may be wondering how to best assist them on a daily basis while ensuring they maintain their honor, dignity, and independence for as long as possible. Your loved one may not need the extensive care a nursing home offers, yet your concerns remain as they reside in their own home with needs showing up in various areas. The yard, home maintenance, nutritional meals, and even their bills may be stacking up and requiring you to step in regularly just to maintain regular activities of daily living. They may have stopped attending their favorite community or church events, and you know that’s just not like them. The good news is that there are assisted living communities that provide residents with daily activities, tasty nutritious meals, and the help needed for activities of daily living like self-care. 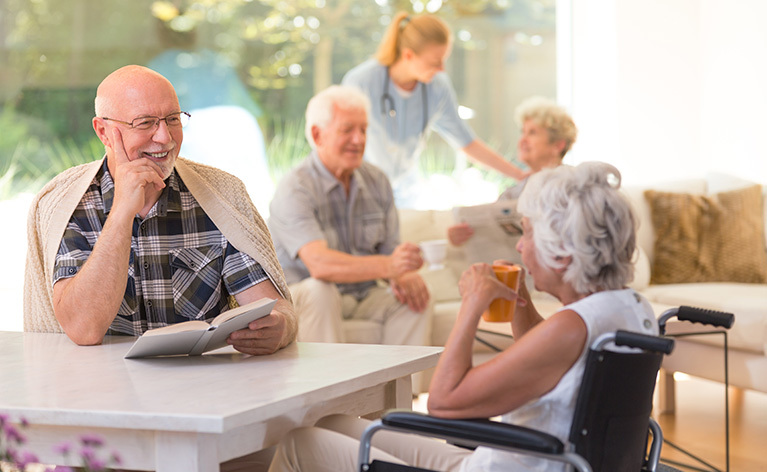 The beauty of assisted living facilities lies in their unique ability to provide assistance as needed for each resident. They customize their assistance to allow each resident to maintain their independence and freedom in as many areas as possible for as long as possible. They honor the abilities of their residents and don’t try to do things for them that the residents are able to do for themselves. As you interview various assisted living centers, ask lots of questions, observe the atmosphere, and consider even eating a meal in the dining room to get a taste of the delicious, nutritious meals they prepare. Here are some surprising things to know about assisted living that will give you peace of mind as you journey toward the next step in caring for your aging loved one. 1. You can’t imagine how many daily activities there are to choose from for fun. Most assisted living communities have an activities director who creates monthly calendars filled with diverse activities from which to choose. Participation in onsite as well as community activities provides healthy socialization and great opportunities to enjoy life during one’s senior years. Laughter truly does good like a medicine, and activities often bring laughter and joy to each participant. The great thing about assisted living communities is that they provide many more activities than most seniors participated in previously. While residents are not obligated to participate in the activities offered, it’s enriching to have so many meaningful opportunities at their fingertips. 2. Assisted living communities differ vastly from nursing homes. Assisted living communities are primarily comprised of quaint apartments designed for seniors who may need some help with daily personal care. Assisted living communities have medical staff available if needed, but their goal is to promote independence for their residents. In contrast, nursing homes provide more comprehensive care physically and medically because their residents typically have more medical needs. Nursing homes don’t have the capacity to allow residents to live in their own private residence within the home. Rather, they have 1-2 residents in a room, a dining room, and a shared gathering place for activities. 3. Assisted living communities vary from each other. Some communities offer basic services and amenities; others offer a broader range of conveniences. Onsite wellness programs and transportation services are some of the specialty items some communities may offer, while others may not. Each community is unique and provides differently for their residents, so take your time looking for the community that is best for your loved one. Research, referrals from friends, and simply talking with the residents and families of residents at the locations you are considering are all great ways to get an accurate feel for what the community is like. Look at several options before deciding which is best for your loved one. Your investment of time will pay off in the end. The Parke Assisted Living Community invites you to discover the quality of life available for your loved ones. Check out our services and amenities page to learn about the diverse opportunities we offer residents. Our 24-hour staff takes care of pharmacy services, housekeeping, monthly wellness clinics, meals, activities, entertainment, and more. We look forward to meeting you and your family and discussing the best possible solutions for your loved one. When your family member is ready for senior assisted living arrangements that provide socialization, as-needed care, independence, and enriching activities, our elegant, state licensed, Tulsa area assisted living community, The Parke, is honored to provide for your needs. Call us today at 918-249-1262 to schedule a tour and complimentary meal.